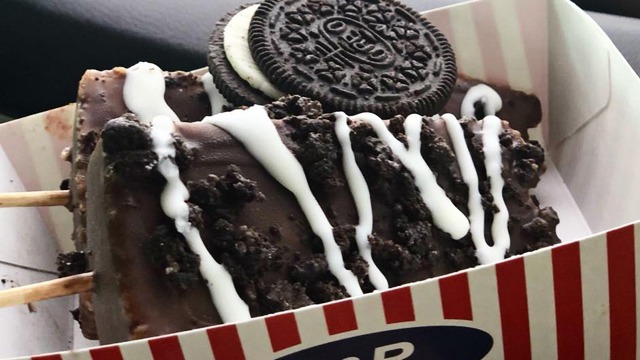 The infamous villain served as inspiration for some of this new eatery's most interesting menu items. (SPOT.ph) What a wonderful time to be a geek. 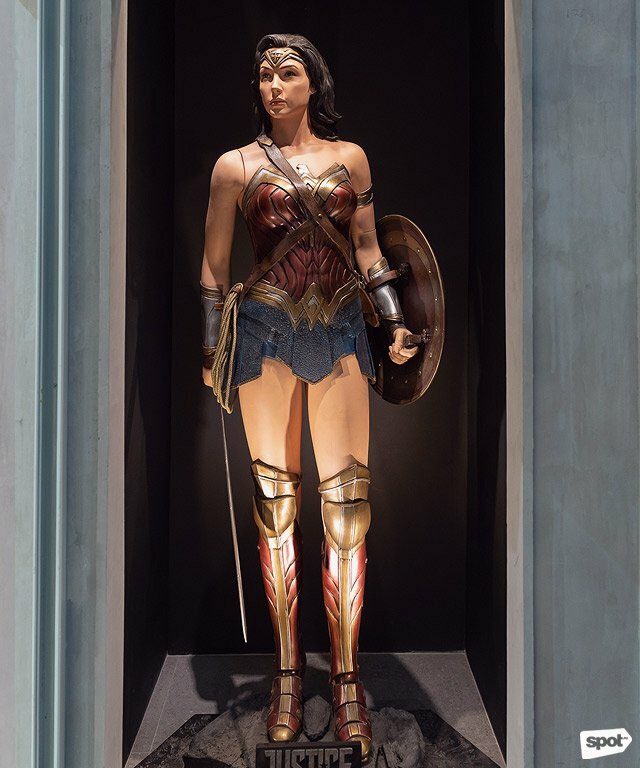 Superhero movies have pushed comic culture into the mainstream, and declaring your love for folks in skintight spandex—who sometimes wear their underwear on the outside—no longer raises eyebrows. 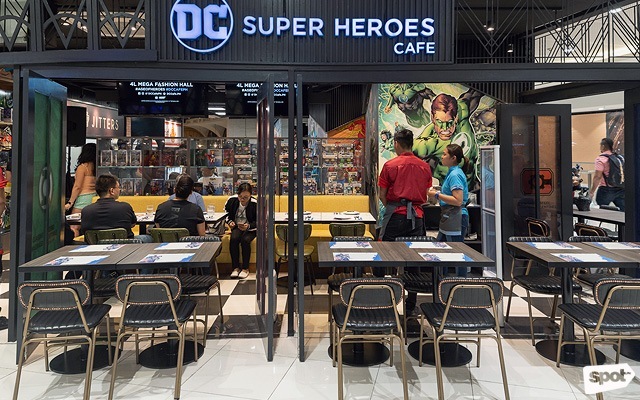 On June 23, Manila welcomed DC Super Heroes Café, a comic book-inspired eatery that revolves around DC Comics characters. 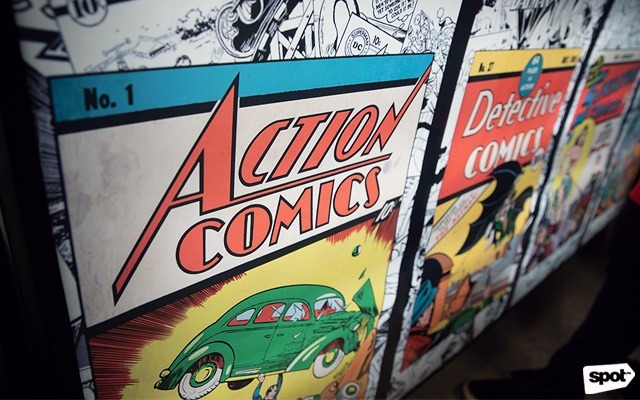 Managing Director Edric Chua, a self-confessed “DC fanboy through and through,” wanted to create a haven for geeks and put his love for comics literally on display. Chua is also the man behind Satchmi, another outlet for his other hobbies: Vinyl records and photography. 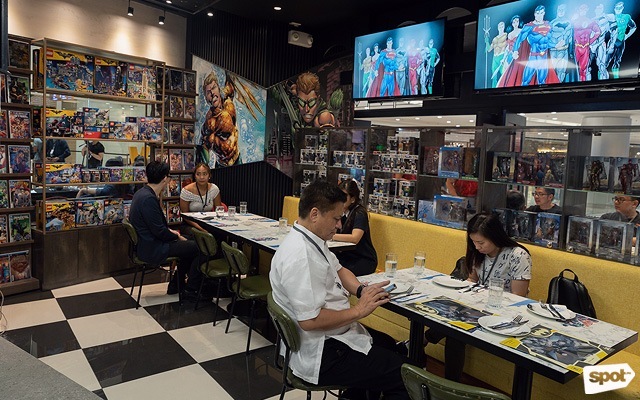 Chua wants guests to develop a deeper love for comic culture at this new dining destination in SM Mega Fashion Hall. 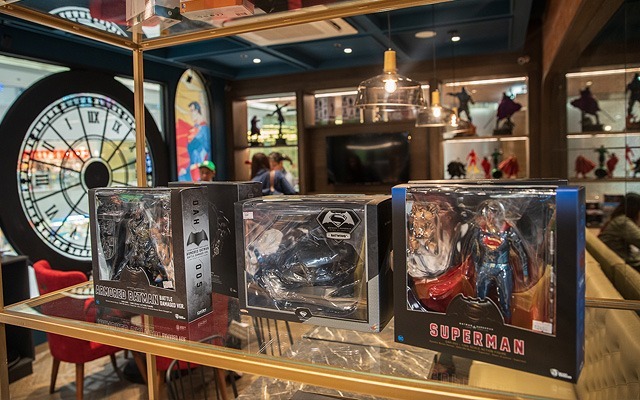 In fact, he’s partnered with comics and toy suppliers to make the café a nexus of all things DC, with various superhero comics, toys, and merchandise on the shelves. “Everything but the tables and chairs,” Chua quips, is for sale. This allows for the displays to change and provide a sense of dynamism and freshness throughout the restaurant. 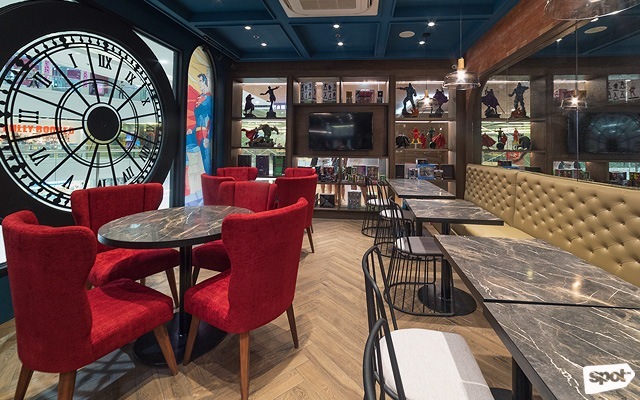 Designed by the coincidentally named DeeSee Interiors (you can’t make this up), DC Super Heroes Café’s aesthetic is a combination of a classic American diner, an underground bar, and a mobster private-dining club punctuated with various DC bric-a-brac. 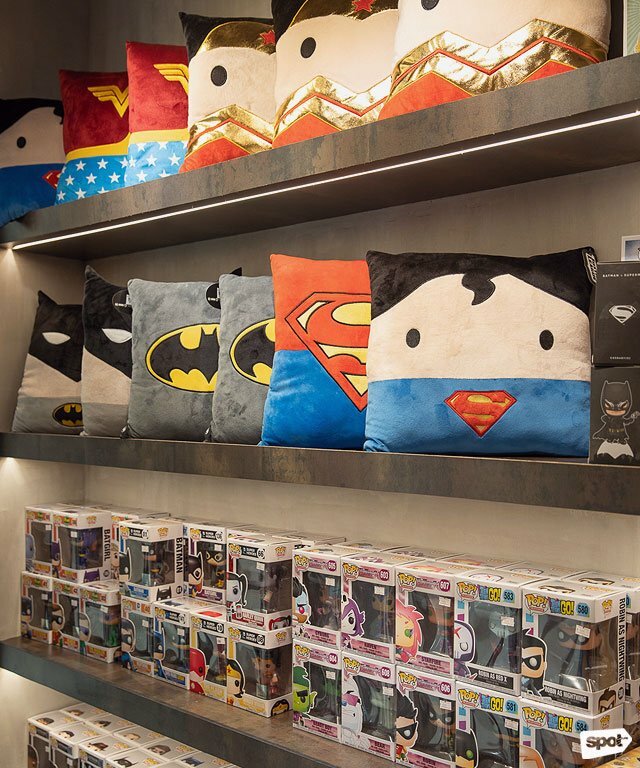 There’s also a small nook dedicated to selling exclusive merchandise, from bags and shirts to throw pillows. 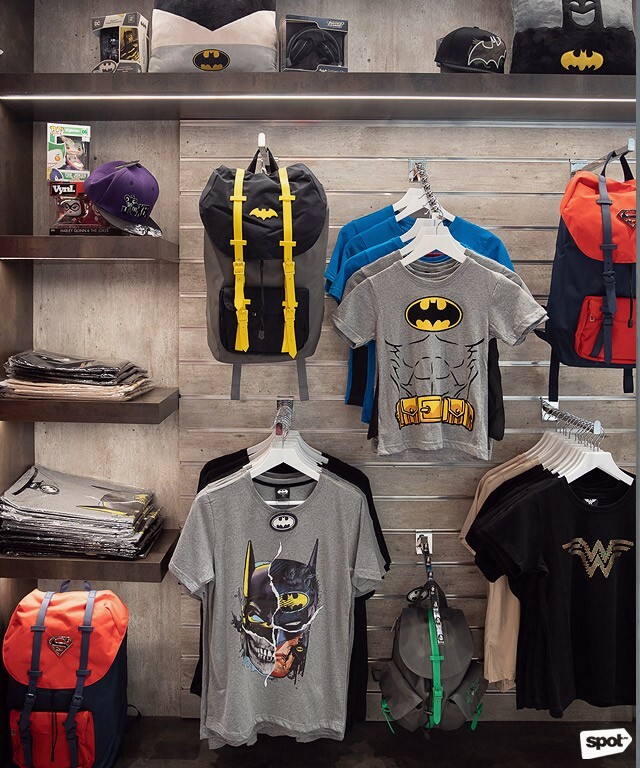 With so much of a thematic and merchandising push, it’s easy to think that the food is just an afterthought. But food is actually what comes to save the day at DC Super Heroes Café. Chua brought in Chef Mikel Zaguirre of Locavore fame to develop dishes that were unlike anything else in the local food scene. Chef Kel didn’t grow up a comic fan like Chua, which was a big challenge because Chua had instructed the chef to infuse the dishes with character. And by character, he meant comic-book characters. Chua plied Chef Kel with required readings as a crash course to superhero culture (“I didn’t finish it all,” the chef confides sheepishly) and for a year they worked on a creative menu while sticking to the DC-superhero theme. 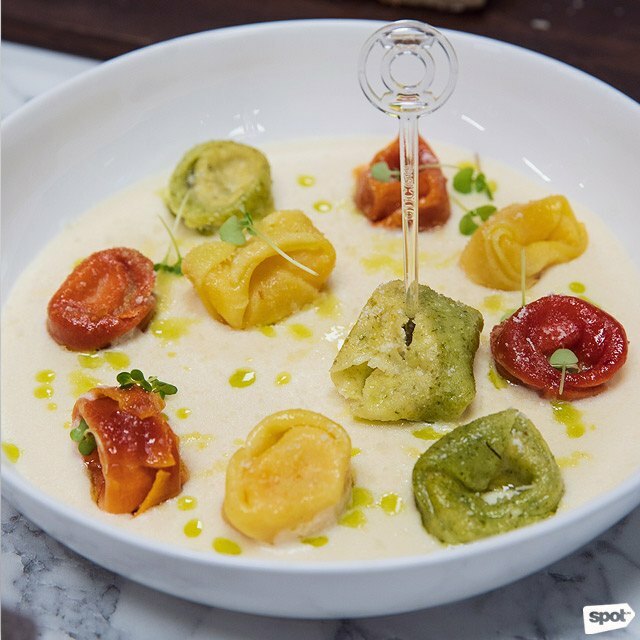 The concepts and presentation of the dishes border on haute cuisine, belying the family-friendly concept of the restaurant. 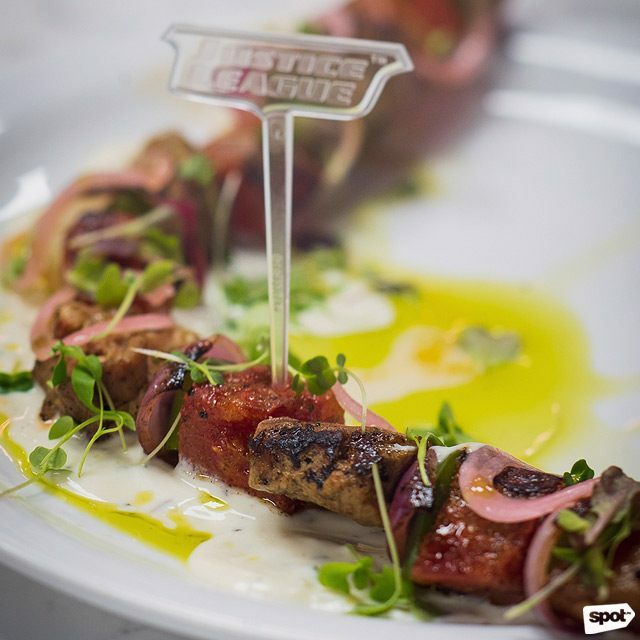 The Captain Boomerang-inspired Lamb Skewers (P580) is a real winner, which uses tender Australian lamb. It’s artfully laid out on the plate in the shape of a boomerang, too, for that added appeal. The lamb is tender and flavorful, and is complemented by grilled watermelon and the tang of tzatziki. Chef Kel is also proud of the Arthur Curry a.k.a. 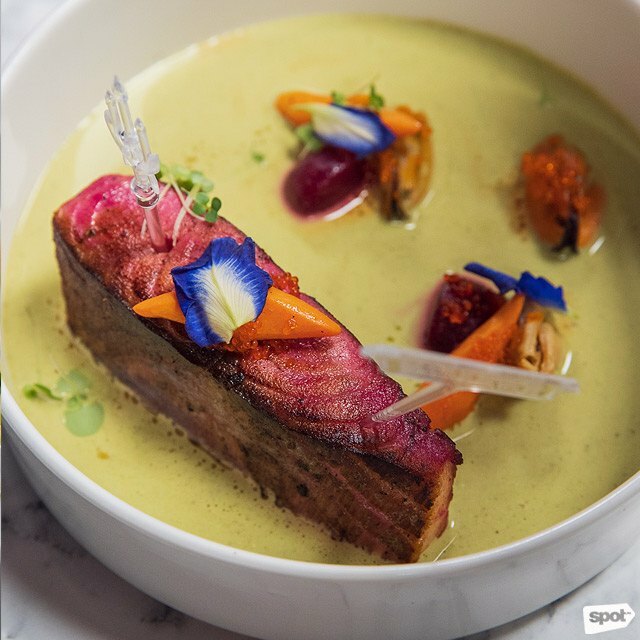 Aquaman-inspired Salmon & Green Curry (P540), which is a sublime fusion of flavors using cured salmon on a bed of green curry with mussels, ikura, and baby carrots. 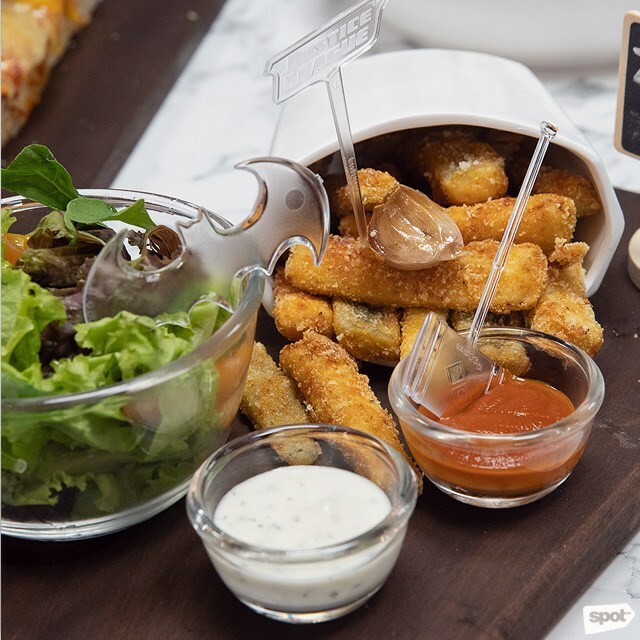 Not all dishes are on the mark conceptually, such as the supposedly Cyborg-themed Crab Rangoons (P380), or the Flash-inspired Pepperoni Focaccia Pizza (P480). 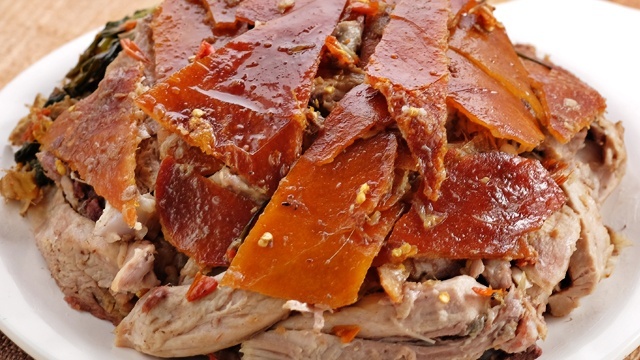 Nevertheless, all are delectable dishes in their own right. Others are a fun take, such as the Green Lantern corps-themed Three-Cheese Tortellini (P390) with green, yellow, and red tortellini in a smooth and creamy alfredo sauce; and the Joker-inspired Zucchini Fries (P380), a deliberately confusing non-potato fries with not-ketchup. But the dishes Chef Kel is most excited for are The Belly Buster (P380) burger, which fans of television’s Arrowverse will recognize from Big Belly Burgers; and the Bane-inspired 12-Hour Glazed Pork Belly (P480). The burger is a 1/3-pound Angus beef patty cooked in beef fat and served in a buttery brioche with cheese and a special sauce. 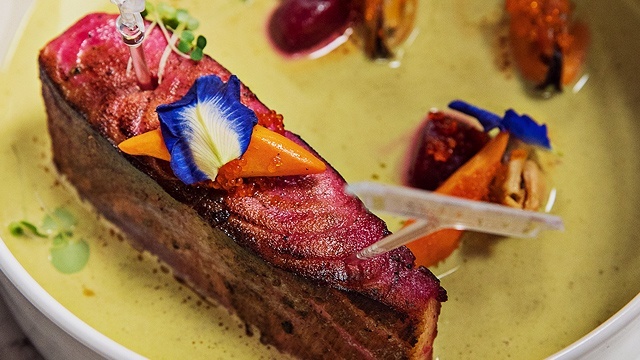 Meanwhile, the pork belly’s 12-hour smoking process is inspired by Batman nemesis Bane’s venom drip, which the brawny villain needs to take every twelve hours. 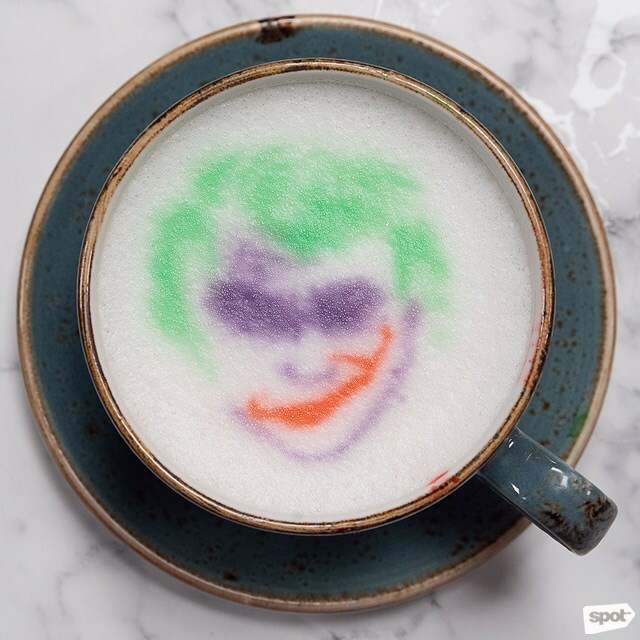 Chua also recruited mixologist Kalel Demetrio (otherwise known as the Liquid Maestro), who crafted the restaurant’s signature drinks such as the Joker-themed Taro Purple Spiced Latte (P160). It’s an unassuming drink with a spicy kick, which he dubs as, “the joke’s on you!” for the surprising aftertaste. The Wonder Woman-themed Berry Cheesecake Smoothie (P190) is a refreshing choice that comes with a tiny plastic sword, perhaps to fend off sweet cravings. 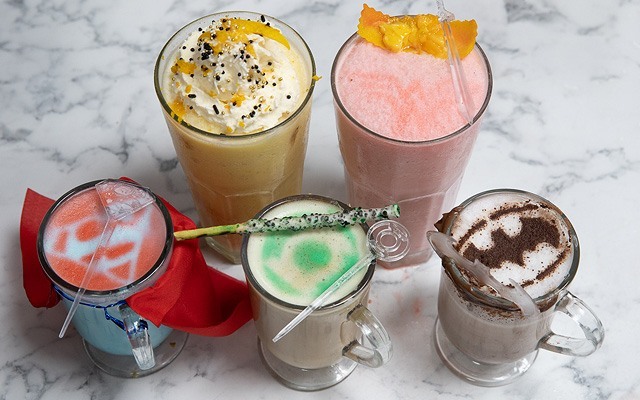 DC Super Heroes Café also serves cocktails, such as Roses & Thorns (P280), a gin-and-rum-infused concoction of rose essence, milk, cucumber, and tapioca. 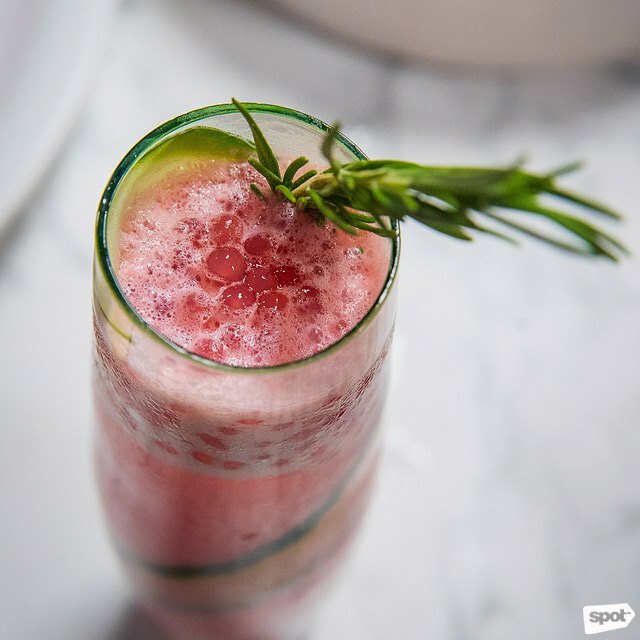 The Power Sour (P280) is a refreshing, zesty, and lemony drink with bourbon, dark rhum, and tea liqueur, sweetened with guava syrup. Super heroes and alcohol aren’t terms you often see together, but maybe even crime fighters need to kick back after putting villains away at the end of the day. 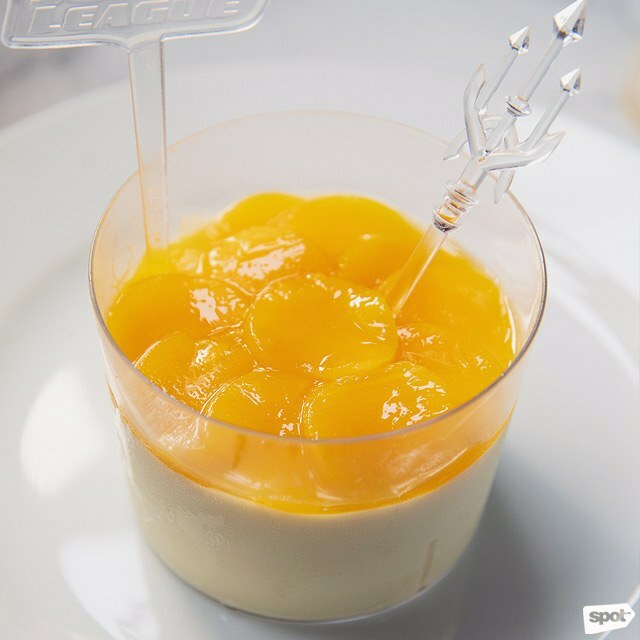 The desserts are a visual treat, too, like the unadorned creamy-sweet Mango Panna Cotta (P170), which rises to the occasion. 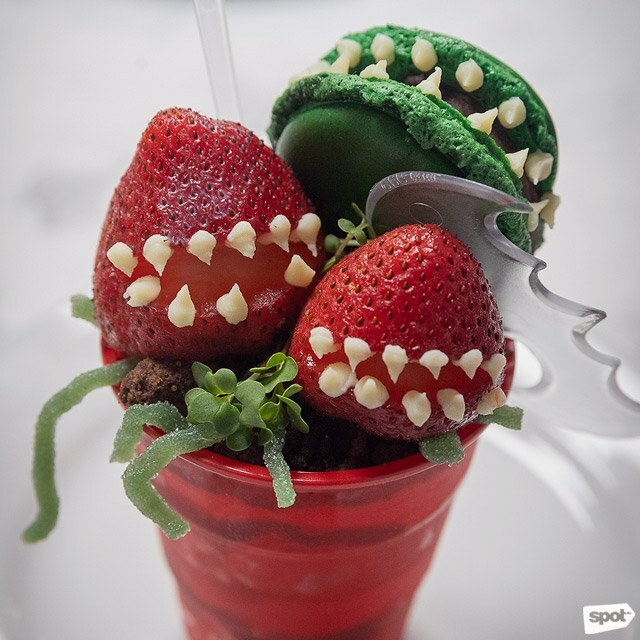 In contrast, the Poison Ivy-inspired Strawberry Trifle (P170) is a busy, delightful assemblage of various flavors and textures that might be the most visually arresting treat in the resto, with a Little Shop of Horrors vibe, but it only just comes together on the palate. 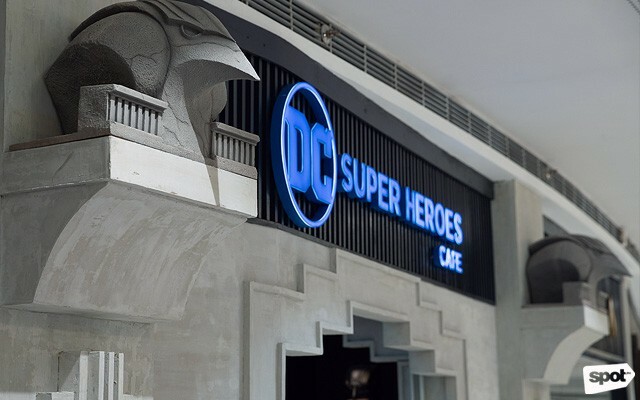 DC Super Heroes Café is a complete dining experience that satisfies the senses. The little details reveal how much geek love has gone into the creation of this joint. 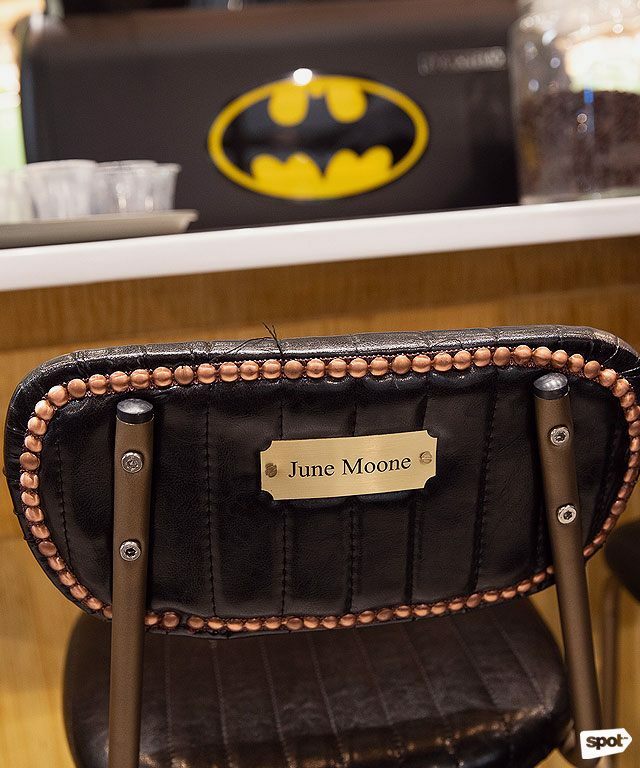 The seats have nameplates with the secret identities of heroes and villains, much like private clubs name seats and reserve bottles for best customers. But don’t let comics-inspired aesthetic, the fancy plating, and sometimes shoe-horned character themes distract you from the fact that this geeky haven is attempting to push the envelope with its dishes. DC Super Heroes Café doesn’t lose sight of the fact that in a restaurant, the food is the real hero. Update as of August 3, 2018 (2:24 p.m.): Contact number has been updated to 477-5673.